The AVR-X2500H features Dolby Atmos and DTS:X, the latest video technologies; 4K Ultra HD, Dolby Vision, HDR10 and HLG; and 8 HDMI in/2 out with HDCP 2.2 support on all ports. Stream Spotify, Pandora, Tidal and more with HEOS built-in. unparalleled music playback options, thanks to our built-in HEOS technology, Apple AirPlay 2, and Amazon Alexa voice compatibility for seamless control. 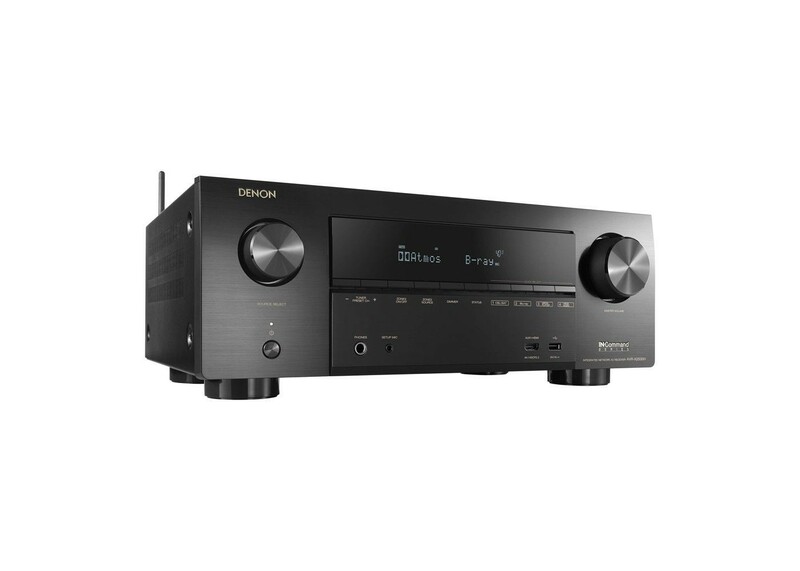 The Denon AVR-X2500H supports Dolby Atmos, DTS:X and DTS Virtual:X, plus the latest video technologies such as Dolby Vision, HDR, HLG and 4K video upscaling. It features 8 HDMI inputs and 2 outputs with HDCP 2.2 on all HDMI ports. Stream Spotify, Pandora, Tidal and more with HEOS multi-room wireless technology, play music in multiple rooms and control it all with your voice through Amazon Alexa compatibility. Ideal for custom integrations, the AVR-X2500H is the entertainment centerpiece to help you build your perfect home theater. With more than 100 years of audio excellence at Denon, true audio-enthusiasts are guaranteed the best quality sound. Amazon Alexa voice control compatibility allows for the hands-free control of your AVR-X2500H and wireless music services. Every sound, all your music, controlled effortlessly. Full wireless connectivity is provided via Bluetooth and Wi-Fi. The AVR-X2500H works with Apple Airplay 2 and Amazon Alexa, bringing cutting-edge voice control and incredible sound to all your home entertainment. The built-in HEOS technology allows the AVR-X2500H to become the app-controlled heart of a whole-house wireless sound network. The AVR-X2500H easily guides you through the set-up process to ensure the most accurate configuration and lets you optimize all settings for the best possible sound and video quality. Audyssey MultEQ room measurement system guarantees great sound in every room. The AVR-X2500H boasts an advanced video processor to upscale existing lower resolution video from any analog or digital source to true 4K. With three HDMI outputs, you can even connect a TV and a projector in the main room, while playing back different content on a second zone screen. The AVR-X2500H features the Audyssey MultEQ room acoustic measurement system. With the supplied microphone, it precisely analyzes the output of each speaker to optimize every channel. Plus, the additional Audyssey MultEQ Editor app (available for purchase) allows advanced users to go "under the hood" for further adjustment and customization of your audio environment. The heart of your wireless network. With Bluetooth and Wi-Fi wireless streaming connectivity, the Denon AVR-X2500H is equipped with an advanced dual antenna transceiver system for robust streaming even in congested urban environments. Enjoy listening to your favorite audio content wirelessly from your smart devices. Better control in your back pocket. The free Denon AVR Remote app for iOS and Android makes using the AVR-X2500H even easier — adjust volume, turn it on or off, mute the music, select a source or switch to HEOS. Download the free Denon Remote app to your smartphone today. The Denon AVR-X2500H front panel features four Quick Select buttons that store your preferred audio settings for each source. Switch between TV audio, Blu-Ray, media players and more–and the AVR-X2500H adjusts the EQ settings to your preferences for that media source. Use the buttons on the front panel or opt for the same Quick Selects on the AVR remote for faster control. Incredible power for your music and movie needs. The AVR-X2500H includes an advanced DSP (Digital Sound Processor) chip for tremendous power processing. With four 300MHz DSP cores that are capable of processing over one billion computations per second, the AVR-X2500H supports the latest video, sound and processing needs. For optimum fidelity and the widest dynamic range with lowest distortion, the Denon AVR-X2500H features advanced reference-class 32-bit AKM AK4490EQD/A converters on all channels. Enjoy consistent high-fidelity and precise channel matching across all channels for the ultimate listening experience. Stream music stored on your home network–connect to HEOS wireless speakers or even other HEOS-enabled receivers and listen throughout the whole house. Enjoy music from TuneIn, Internet Radio, Pandora, Spotify, Amazon Prime Music, iHeartRadio, SiriusXM, Soundcloud, Tidal, Napster or Deezer. HEOS technology within the AVR-X2500H allows you to stream your favorite music wirelessly around your home to any other HEOS-enabled device, like HEOS speakers. The AVR-X2500H is part of Denon's range of IN·Command series of custom integration friendly AV components, equipped with feature-rich enhanced control capabilities and compatibility with third-party and custom integration solutions. The AVR-X2500H features IP control capability for an integration with major third-party control devices and Control4 SDDP (Simple Device Detection Protocol) certification for quick and easy integration with Control4 home automation equipment. For direct connection to external home automation and control equipment, it's also equipped with an RS-232C serial port. For simpler integrated control set-ups, the AVR-X2500H features an IR (infrared) remote control input on the rear panel, allowing remote control compatibility with other components in your home theater system.